There is a Bulk cooking day in process at our house. Yes, it can be intimidating, but it’s SO worth the time. Where should one start when you no idea what to do? With five minutes of preparation time, this easy Crock pot Barbeque Chicken dinner is a reality. 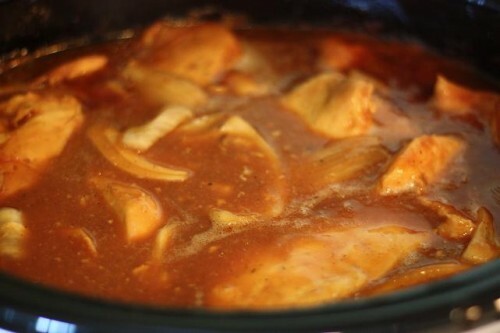 Throw a huge amount of chicken in the crock pot, some BBQ sauce, and you’re on your way to making multiple meals with this recipe. Right now I have homemade french bread rising (perfect recipe for beginners), and 8 pounds of ground beef thawing right next to my 15 pound turkey. (Hopefully, they’ll be ready for tomorrow.) I will have enough turkey for dinner, turkey pot pies, and shredded turkey to put in freezer bags. We’ve already finished up our homemade refried beans from last time around (vlog), so I’m beginning to soak them now. Next up is a quadruple batch of the best ever Neiman Marcus chocolate chip cookies with detailed bulk instructions, and some banana bread. If you enjoy BBQ Chicken, you will adore my Oven Bake Barbeque Chicken Thigh recipe as well. 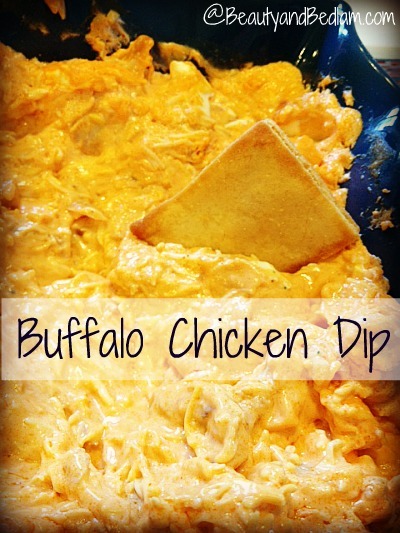 I love tweaking the recipe just a bit and making this easy and addicting Buffalo Chicken Dip recipe. It’s perfect for a gourmet sandwich filling as well. Enjoy how many meals you can get from this simple recipe. Add everything into crock pot and cook on high for 3 hours or cook on low all day. Shred after it’s all done cooking. Add more sauce to meet you favorite consistency when it’s done cooking. The chicken and sauce size were difficult for me to guess because it’s dependent on how much chicken you want to fit in your crock pot. To me, filling it to the bring is essential so that you can have enough extra chicken for additional freezer meals. You can not do anything “wrong” with this recipe as long as your crock pot is filled 2/3 of the way full. I add the water so that sauce may be used on top of rice for a meal. Then take the additional shredded chicken and baggy it up for future meals. Oooh, my mouth is watering! 🙂 Looks SOOO yummy!! Thanks for the inspiration, now I know what we’ll be having for dinner in the next week! This does look yummy though. @Jens, Well, I’m not from Lexington at least :). I grew up in Asheville and they’re not so particular about their barbecue. I must confess that barbecue slaw (with barbecue sauce IN the slaw) was a bit odd to me at first . I like it on the sandwich now that still think it’s gross plain. Have you tried Ciabatta bread? It takes less than three minutes hands on time total and is SO yummy! I haven’t tried it with the pulled BBQ chicken, but we’ve had it many, many times with other things (including broccoli crab soup this evening!) but your timely post after having that yummy bread makes me think I will have to try the two together soon for a super easy and yummy dinner! And I already do the exact same thing!!!!!!!! Wow, I’m glad to know I’m on the right track 🙂 Actually, to use a little less bbq sauce, I add maybe 3/4 cup per 3 chicken breasts, water to cover the chicken, and then after I shred it I add extra bbq sauce on the sandwich. Yes! I’ve made this before. Great, easy recipe! I started making this very thing back when I was working outside the home–I’m afraid it didn’t come out of trying to make an easy meal that could also be used later, but out of sheer desperation at having nothing planned for dinner;). Another version I make is to replace the BBQ sauce with salsa and, after shredding the cooked chicken, I toss in some refried beans, grated cheddar, and cottage cheese (weird, I know, but it tastes good). In spite of being cooked in salsa, they turn out quite mild–the flavor without the spice. I mainly use it to make frozen burritos for my husband to take to work with him. this is right up my alley! can i use *any* kind of sauce? i have KC Masterpiece stockpiled now from Harris Teeter’s freebie a few weeks ago. will that work? We have done something like that but we use a can of cola and a bottle of bbq sauce. I do it in either the crock pot or a pot on the stove top. I am going to try the Easy BBQ chicken. Thanks, Jenn. You have just given me an easy recipe for when we go on vacation with the extended family. We each pick a night to cook for everyone so we aren’t having to eat out all the time. Is the chicken thawed or frozen when you do this? Thanks. Kimberly Baker Bowen You can do it from frozen or thawed. I do both often. If frozen, just add on another hour or two. I let it go all day. I think that is for dinner tonight! Is there any way to keep the chicken breasts from getting dry? I tried this yesterday and it ended up cooking on low for 9 hours. It was very tasty, but the chicken was so dry. Any advice? Now that I’m the caregiver for a mother with Alzheimer’s I need easy meals to make. I have fallen in love with my crock-pot. It makes things so much easier for me. Thanks. I’m always looking for an easy savory meal to feed a group of 20. Do you think this would stretch enough, served on hamburger buns? About how many servings do you think this is? Tks!